Thick hair has met it's containment match in this lovely hand beaded hair barrette. The hair barrette is hand beaded using lavender, matte black and shiny gold seed beads, painstakingly stitched one at a time around a quartet of vintage rose glass stones. 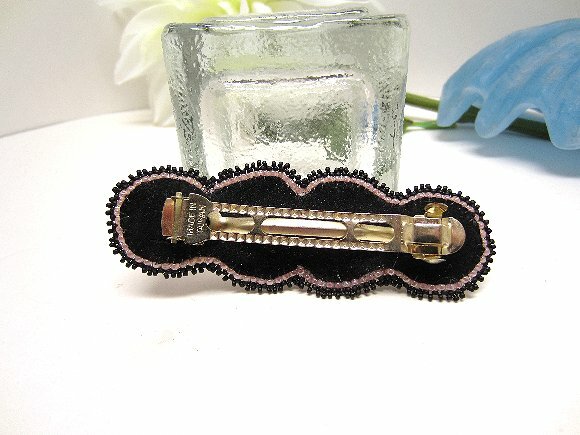 The barrette is about 2-1/2" long, and the beaded portion measures about 3-1/2" x 1-1/2". The color combination is very art deco, and the styling is all my own. Put them all together, and you've got one hair barrette that's as unique as it is useful. Naturally, this hair barrette is brought to you by SPARKLE PLENTY.